I sat in the members’ area to watch Essendon against Collingwood. There were rules regarding clothing which alarmed me somewhat. We were instructed not to wear thongs ( which being British would alarm me even more, as how would they know what underwear I had chosen?? ), ripped jeans, sports wear, ripped clothes etc. I had read enough to understand the points and some basic rules regarding picking the ball up ( why is it called football? ), throwing it, kicking it and scoring. I enjoyed it, could even get into it: wouldn’t say I loved it, as that would be unfaithful to the real game wouldn’t it? Here’s a list of things I learnt or found strange. there are 18 men on each team. each wearing very short shorts. There are some other points to make. Essendon won. And I found that very pleasing as that is who I was barracking ( new Australian word for me). I think that’s all. 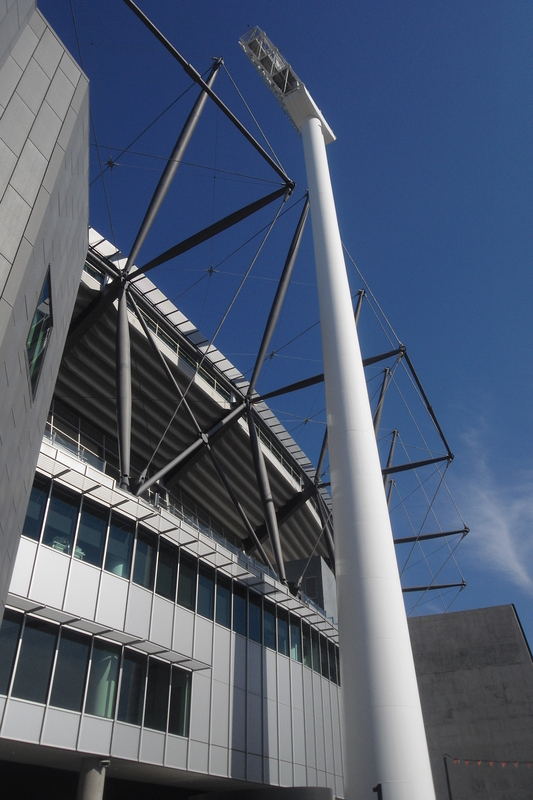 It was at the Melbourne Cricket ground. Oh, and in fear or being embarrassingly late, I got there 40 minutes early. Now THAT’s not normal for me at all..
Posted on May 22, 2012, in Australian Adventure and tagged Australia, Australian Rules Football, football, Melbourne, travel. Bookmark the permalink. Leave a comment.